This is Nannie Jackson. 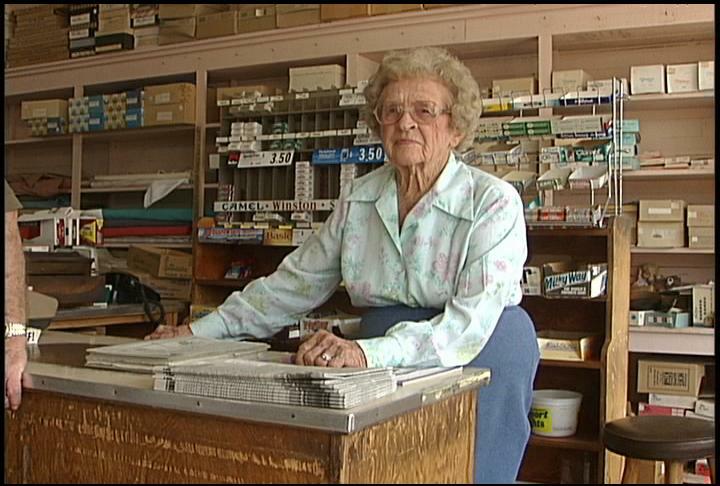 Nannie is 99 years old and works every day in a little grocery store in Horton, outside of Albertville. She will be 100 later this year and says she plans to take the day off. This fine lady looks nowhere near 99, and probably has more energy than I do. This is the story of the day here on Sand Mtn. I was planning a story on CAFTA and its effects on the sock mills of Fort Payne, but this is vacation week for the mills and they are closed. Otherwise, things are very slow here, no "real" news to report. Cool story....wonder what she plans for her day off? I'll be back tomorrow. So what story you got lined up for me??? Been knowing Miss Nannie and Billy since I was a little boy, some 50+ years now. No telling how many people have come and gone thru her store in horton..